1800 Count Deep Pocket Bed Sheets 6 Pc Set Just $24.29 (Queen)! Ships FREE! You are here: Home / Great Deals / 1800 Count Deep Pocket Bed Sheets 6 Pc Set Just $24.29 (Queen)! Ships FREE! Order this luxurious 1800 Count Deep Pocket Bed Sheets 6 Pc Set for Just $24.29 (Queen)! Ships FREE!! On sale for $26.99, use promo code SALE to get an extra 10% off! Sleep great in luxury and soothing soft comfort. 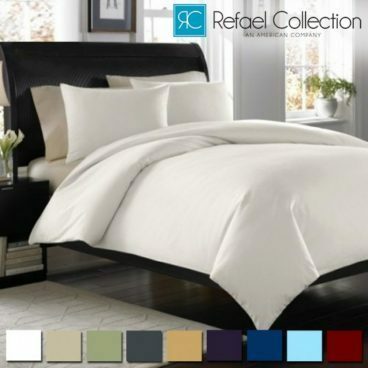 The 1800 Count Deep Pocket Bed Sheet Set by Refael Collection™ is so soft and soothing, you’ll sleep better than ever. This incredibly luxurious set includes a fitted sheet, flat sheet, and 4 pillowcases, giving your bed a whole new look and feel. The fabric is super soft and cozy. It’s also incredibly durable; giving you years of use. Order today and sleep great.